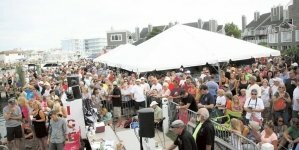 The famed WMO has been well-documented over the years by regional and national press, but most of what’s reported is after-the-fact, from the scales at Harbor Island after the boats are docked for the evening, when fish are weighed and prizes are awarded. Where the action really takes place is up to 100 nautical miles from the Ocean City Inlet in the wide, watery swath of the Atlantic, where lines are baited and teams of fishermen endure long periods dormancy interspersed with “explosions” — 100-plus lb. fish leaping out of the water and testing the crew members’ luck, their skill, and giving them a run for their money. Five Days in August (Official Teaser) from Nicholas Ruff on Vimeo. A Maryland native, Ruff grew up taking summer vacations to Ocean City and spending time at Harbor Island, where he’d watch the boats come in and the fish hit the scales over the duration of the five-day tournament. One day, talking to his brother, he realized that they didn’t know what fishing in the tournament truly entailed — and they wanted to find out. 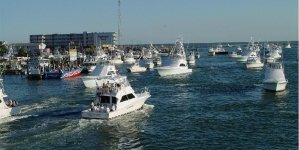 Ruff was surprised to find that, in the 44-year history of the White Marlin Open (now entering its 46th year in 2019), no one had ever sought to make a feature-length documentary about the tournament. 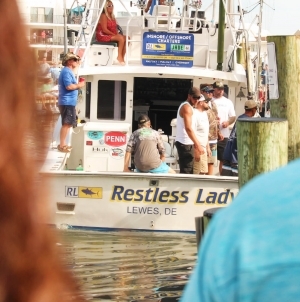 After receiving the go-ahead from White Marlin Open founder and president Jim Motsko, Ruff assembled a small team of filmmakers to shoot the documentary. They joined the crews of the Stalker, captained by Steve Moore, and the Marli, captained by Mark Hoos, over the tournament week, August 7 – 11, 2017, and recorded everything they saw during the five days of fishing, from sunrise to sunset. 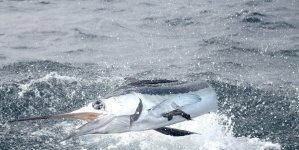 Ruff had never been offshore fishing before, let alone fishing in the White Marlin Open. 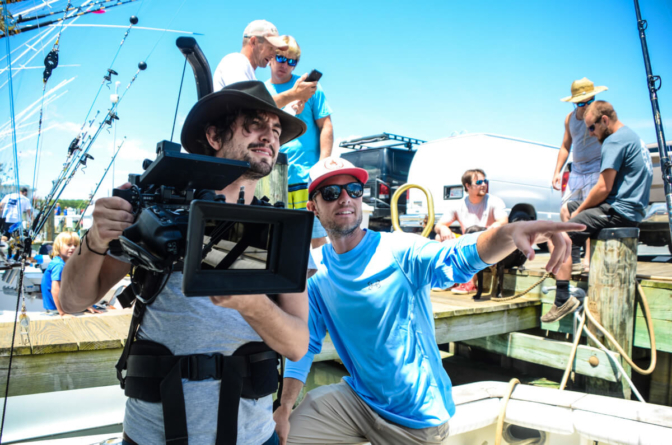 He wanted to make the movie from the perspective of someone who hadn’t been out there before, he said, and shot scenes based on what he was genuinely curious about, having expert fishermen and veterans of tournament explain what was happening in real time. In addition to everything that goes on during the White Marlin Open, “Five Days in August” also features some beautiful shots of Ocean City. “Half of it to me was writing a love letter to Ocean City and showing it off in a really nice way,” Ruff said. Sportfishing consists of long periods of waiting around for something to bite, but when there is something on the end of the line, there’s a definite adrenaline rush that comes with reeling in something big. That adrenaline rush feeling that’s depicted in the film is something that Ruff thinks all viewers can relate to, even if they aren’t passionate or experienced fishermen. “Five Days in August” premiered in Ocean City last August, a year after it was shot. 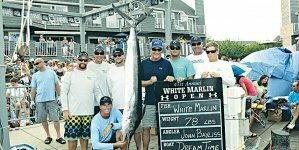 It debuted at the White Marlin Club to a crowd of 200 people, selling out instantly and premiering just a week before the White Marlin Open of 2018. The documentary will be screened for the public again at the upcoming Ocean City Film Festival at 2 p.m. on Sunday, March 10, at the Carousel Hotel. The screening will mark the first time the film has been shown featuring footage of the 1933 storm that cut the Ocean City Inlet. The footage, which Ruff said has been sitting in storage for years, has never before been seen in high-resolution. 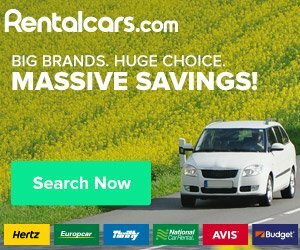 More information and updates about the documentary can be found on fivedaysinaugust.com. Cover image photo by Kirby Sybert. All other photos courtesy of Nick Ruff. When do most things open up for the season? There are lots of year-round businesses, but some opened for the season over St. Patrick’s Day weekend, and more will steadily be opening ’til Memorial Day. Just depends!